Steve Mellor Accident Repair Centre Ltd had a very successful evening at the recent Vizion Network Shine Awards winning two out of the three categories in which they were nominated. 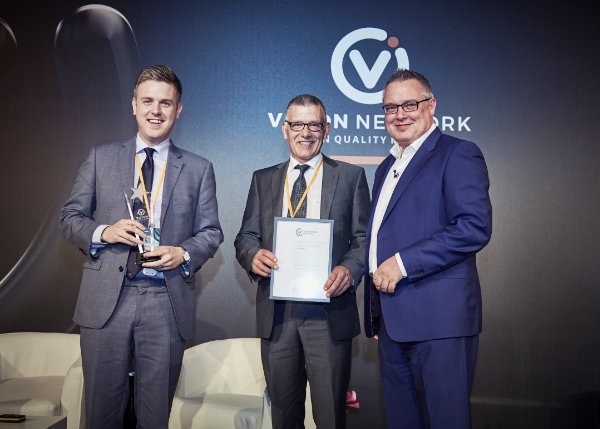 At the awards ceremony, hosted by Vizion Network chairmen Chris Mckie and Eamonn Dunne at the Birmingham Hilton Metropole, winners were selected from the 800 repairers in the network. Nominated in three categories - Customer Service Score League, Bodyshop of the Year (Region 3) and the people's choice award, Steve and the team are extremely proud to announce they came out on top in both the customer service score league and bodyshop of the year categories. The customer service accolade is based upon all 800 repairers in the network and was awarded for our high CSI (Customer Satisfaction Index) scores for the year averaging at an impressive 98% customer satisfaction. The bodyshop of the year award is split into four regions of around 200 repairers each. The criteria for the award is based on a number of key performance indicators throughout the year including repair quality, cycle times, high positive customer feedback and minimal customer complaints. To come out on top in these categories against such fantastic competition is an incredible achievement of which we are immensely proud. To be awarded these accolades from the nations biggest repairer network is testimony to the hard work Steve and the team have put in over the years in an effort to deliver a better service to all of our customers. Recognition for our speed, quality and customer service on a national scale is both satisfying and encouraging that we are providing the services we are aiming to. A huge thank you also goes to you, our customers, because without you none of this would be possible.